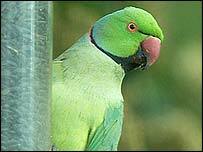 The number of wild parrots living in England is rising at 30% per year, says an Oxford University research project. Parks and gardens in the leafy London suburbs have been adopted as a preferred habitat by birds that are native to southern Asia. In the Surrey stockbroker belt, a single sports ground is believed to be home to about 3,000 parrots. The rate of increase, helped by mild winters, is much greater than had been expected. The findings have also been echoed by a large number of e-mails from BBC News Online readers, who have reported how parrots - particularly parakeets - have now become familiar sights. These hundreds of e-mails, including photographs, highlighted hotspots such as west of London, Surrey and parts of Kent. 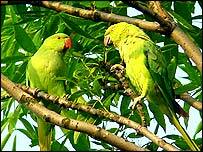 But there were also parrots reported in inner-London, including parks in Peckham, Brixton, Greenwich and Kensington. 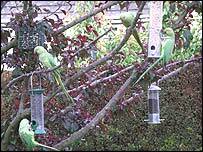 And a few parrots had been spotted in East Anglia, the North West and in Scotland. There were also sightings from readers overseas, reporting urban parrots in the Netherlands, Belgium, Germany, France, Spain and the United States. E-mails from readers also offer a range of theories about the arrival of parrots in Britain - including that they were brought by Jimi Hendrix, that they escaped during the making of a film and that they were released from aviaries damaged during the great storm of 1987. The findings, from Oxford University's Edward Grey Institute of Field Ornithology, give a glimpse of exotic creatures in unlikely places. Last summer, there were areas of woodland that sounded more like equatorial rain forest than suburban parkland. The population boom has been put down to a series of mild winters, a lack of natural predators, food being available from humans and that there are now enough parrots for a wider range of breeding partners. In particular, they have been observed in growing numbers in the outer suburbs and the Home Counties, with trees in parkland and sports grounds becoming their homes. Esher Rugby Club's ground was observed to have had a parrot population that grew from 800 to 2,500 in the space of three years - and researchers estimate there might be 3,000 living there. Project Parakeet, led by researcher Chris Butler, has been examining the growth of the population of wild parakeets - with the aim of finding whether the current sharp increase will continue. If it does, there are concerns that wild parrots could become a pest to farmers or threaten other wildlife. Grahame Madge, spokesman for the Royal Society for the Protection of Birds (RSPB), says parakeets are bigger and bolder than some of their native rivals - and "are quite capable of evicting other birds". They also like fruit and he says that if they moved into fruit-growing areas, it would pose problems for farmers. At present, the RSPB says parakeets are particularly concentrated in the west London, south-west London and Thames Valley area - and this has given rise to the urban legend that the birds originally escaped from a container at Heathrow airport. But Mr Madge says there has never been any proof of this theory. 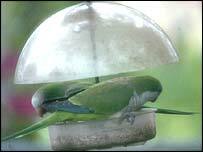 Escaped parakeets have been spotted nesting in this country since the 19th Century. Even though there was a wild population in the 1960s, the numbers remained very low through to the mid-1990s, when the population appeared to start increasing more rapidly. Birdline UK's Parrot Rescue, which looks after abandoned birds, says parrots are now acclimatised to conditions in this country and are quite capable of living and breeding here. But this is causing problems for other native birds, which are being pushed out by the growing numbers of parrots. I saw around 10 or 12 green parrots in my garden one Sunday morning. I tried to tell the wife, but with me being a city boy and her a country girl, I was met with a howl of laughter and ribbing for the following month ... but he who laughs last. Matt Hearn, Pinner, North London. I remember about 20 years ago coming home to Hampton station a little the worse for wear on a summer's evening and seeing a flock of parakeets flying overhead. When I burbled this out to a mate it was clear he thought that I had only seen them as a result of the mid-afternoon lager. It seems, from looking at other correspondence, that south west London is a hotbed of avian immigration. Beats the hell out of seagulls! My wife and I were in Kew Gardens, she said that she saw a parrot, at first I thought she was joking, but five minutes later I saw three of them feeding at a bird table. I remember very well the first time I saw one, it was during a local football match about four years ago in which I was playing goalkeeper. I got distracted by by this flash of green dashing from one tree to another. The opposition took advantage and scored. We ended up losing the game. Damn parrot. This one (see picture above) stayed for about two hours, making short work of the sunflower seeds in the feeder before flying off home, presumably to Syon Park in Isleworth? We haven't seen them since but I did think I heard one two days ago. I have two green parrots visiting my peanut feeding device on my washing line three times a day, everyday. This has been happening since November last year. I've added some parrot feed in the device in recent weeks. I walk past the colony at Westminster University sports ground, just off the Great Chertsey Road, every morning. The legend is the origional pair were let out by Jimi Hendrix. We get parrots around Twickenham all the time - or "posh sparrows" as we call them. When we first moved in, we called the RSPCA and told them that there was an escaped parrot in a tree in the garden. They told us that he'd probably be OK. We thought the RSPCA just didn't care, until we saw flocks of them flying over. A truly wonderful (if not very English!) sight. When I first moved to Ealing a couple of years ago, I thought I was seeing things when I saw a flock of bright green birds in the tree outside. They are regular visitors now. Two parakeets seen flying over my garden two to three weeks ago - any more spotted any further north? Last year during the summer a peach-faced parakeet became a regular visitor to our garden. There must be more because you could here its mate calling from trees across the field. We live in Glazebrook just outside Warrington. You're all either liars or mad. 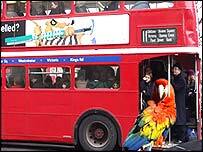 The only place you'll see a parrot in the UK is a pet shop or a badly-stocked zoo. I am sure I saw three in one place, flying from tree to tree beside the car park in Bushey Park, at Hampton Court. I could hardly believe my eyes, but this explains it. Richmond Park has had a colony of green parakeets for some years, but the population does seem to be getting larger. Last summer, there were areas of woodland that sounded more like equatorial rain forest than suburban parkland. There has been a small flock of parrots in my local park for about a year now. I have seen them "mobbing" a heron on one occasion. We have a flock of sometimes up to 20 green parakeets flying around the neighbourhood. You wouldn't believe it unless you'd seen it with your own eyes! I have now seen two parrots in North Norfolk, one about two years ago and the second one three months ago. I thought I was seing things the first time, on the most recent occasion I saw it a few times over a period of about three days. There are lots of smallish green parrots always in the trees round the corner from where I live in Ealing. It seems to be a specific set of trees at the eastern-most entrance to Lammas Park W13. They make a bit of noise but are very pretty and unusual to see. No, I only see parrots in the pet shop but suspect that this is a good indication that some global warming has happened (although I suspect the parrots didn't find their own way here). I was out on my bicycle last night towards dusk passing through Brent River Park near Boston Manor. I cycled past a couple of large trees and scared two very large flocks of parakeets who were nesting above. I have often wondered whether parrots/parakeets are becoming more widespread in the south. Place Guido Van Arezzo - there are several big nest of green parrots. The number has significantly increased in the last three years. I believe these birds started out as a small colony at Laleham Reach, Surrey and appear to have spread up and down the River Thames. I have personally seen them at Runnymede to the west and Hampton Court to the east. The Laleham flock is rumoured to have originated from escapees from Shepperton Film Studios that broke out during the shooting of a film set in the tropics. A little bit of history: the parrots are probably decendants of those few that ecaped whislt filming "The African Queen" at Shepperton Studios. I am fascinated by these little creatures. We have a population of rose-ringed parakeets living here in The Hague. They are usually seen in small groups here and they like park like surroundings. We have a growing flock, which now numbers over 40. They particularly enjoy demolishing the dead oak tree in an adjoining garden and delight in hanging upside down on our bird feeders. They are very noisy in the evenings but are very entertaining to watch. They are certainly more intelligent that pigeons. Ring-necked parakeets are common around here but do not always have things their own way. The peregrine at Queen Mother reservoir became very adept at picking them off last winter. Actually it wasn't dead, it was only resting!